The National Oceanic and Atmospheric Administration (NOAA) said 2018 is shaping up to be “near or above normal” in terms of storm activity; it warned there’s a 75% chance that 2018 will see close to or more than the average number of storms in the Atlantic basin. Similarly, in the Asia Pacific region it’s looking like the window on typhoon season is widening, with an earlier start this year and more activity expected. Facility managers for commercial and industrial buildings in hurricane or typhoon-prone areas – or any coastal area for that matter – would do well to take notice. As last year’s hurricane season made abundantly clear, the damage these coastal storms are doing is more than we’ve typically seen in the past, even from storms that aren’t necessarily category 4 or 5. It seems pretty clear that the reason is global climate change and the rise in sea levels. There’s also another, lesser-known phenomenon at play: sinking land. In some coastal areas, land is actually sinking due to “subsiding coastal lands, oil and water extraction activities, melting ice, or tectonic movement,” according to the U.S. Environmental Protection Agency (EPA). A recent Guardian article has a dire prediction for global coastal cities based on United Nation’s data on projected global temperature increases. The article notes that, “scientists at the non-profit organisation Climate Central estimate that 275 million people worldwide live in areas that will eventually be flooded at 3°C of global warming,” which is projected by 2100. It appears Asian cities will experience the worst impact. Densely populated cities like Shanghai, Hong Kong and Osaka would see millions of people devastated by coastal flooding. Looking across the globe, coastal cities like Rio De Janeiro, Miami and even the Hague would be drastically impacted by projected sea level rises. These sorts of predictions have city planners and managers of major public facilities taking notice. Boston, for example, several years ago launched an initiative to protect Logan Airport, largely in response to the damage Hurricane Sandy caused in New York and New Jersey in 2012. Initial projects include installing temporary flood barriers, watertight doors and waterproof fencing to protect critical assets, according to AirportImprovement.com. Commercial and industrial building owners would do well to pay attention to these sorts of designs, in order to keep water out as tides rise. But these are clearly long-term fixes. 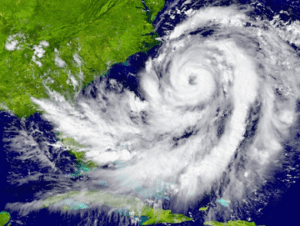 In the short term, with hurricanes forming in coming weeks and months, there are other steps facility managers can take to help ensure their buildings withstand whatever weather comes their way. Test generators under load to ensure they will function as expected when called upon. In some cases, these tests are required. In the U.S., for example, hospitals are required to follow National Fire Protection Association (NFPA) codes that require emergency power supply (EPS) systems be tested at least 12 times a year, every 20 to 40 days, for a minimum of 30 minutes, at specific loads, as detailed in this previous post. Conduct proper generator maintenance, including replacing items such as fuel filters. Those in low-lying coastal areas may also want to ensure building-level UPSs (uninterruptible power supplies) are not in the basement, but on higher floors that are not susceptible to flooding. The same goes for any crucial generators or pumps that you’ll need to fuel those generators. Create a team of emergency personnel, each with clearly defined responsibilities for disaster preparedness and, especially, response. Publish the list, complete with contact information, to appropriate building personnel, such as the owners and key business managers. Have an up-to-date list of third party companies that can help with disaster recovery, including flood water remediation and electrical contractors who can ensure safety of UPSs and other electrical equipment. Have a communications plan. Some disruption is to be expected in the wake of a serious storm. Building owners and occupants will be far more understanding if you communicate with them regularly about the conditions the building faces, as well as expectations for disruption and recovery efforts. Even if this hurricane and typhoon season turns out to be not as severe as prognosticators expect, it’s clear that lasting climate change is upon us. Facility managers across the world are on the front lines in terms of preparing for the worst and literally weathering the storm. For more information on steps you can take, visit the Schneider Electric Industrial Business Continuity web site, which is packed with info on how to keep the power on.